We have an active community of volunteers working in restoration and predator control projects throughout South Wellington. See this list of environmental groups in your local area and get involved! We are an environmental organisation working alongside the Wellington City Council to rejuvenate Tawatawa Reserve on Murchison Street, Owhiro Bay. We come together to plant and maintain the reserve on Saturdays between 2 pm - 5 pm. FOOS has been working to restore and protect the Owhiro stream, the only unpiped stream flowing to the south coast from Wellington City. It is the primary freshwater feed into the Taputeranga marine reserve, providing important habitat for the long finned eel, banded kokopu and potentially for the return of the rarer koaro. Be part of bringing this unique urban stream back to life. Working bees are held each month. Oku Reserve is the headland overlooking Cook Strait between Island Bay and Owhiro Bay. The City To Sea walkway and Te Araroa trail pass through it. The headland is now predominately covered with native trees and plants. The Oku Group volunteers are now phasing down. We propose to provide plant care for the existing trees for a further 2-3 years. We appreciate any assistance from people outside the group for plant care. This group has planted 25,000 native plants on the Island Bay sand dunes since 2003. They have also removed huge quantities of Marram grass and other invasive weeds and continue to carry out a vigilant weeding programme through the areas they have already planted to ensure that natives are not threatened by re-infestation. The little reserve in the heart of Island Bay. Working Bees are on the first Saturday of the month 2 pm - 5 pm. Access at the end of the lane, 46A Derwent Street, Island Bay. The school's Rainforest Project was initiated in 2004 with support from Manawa Karioi Society stalwarts Sally Bowman and Peter Russell. 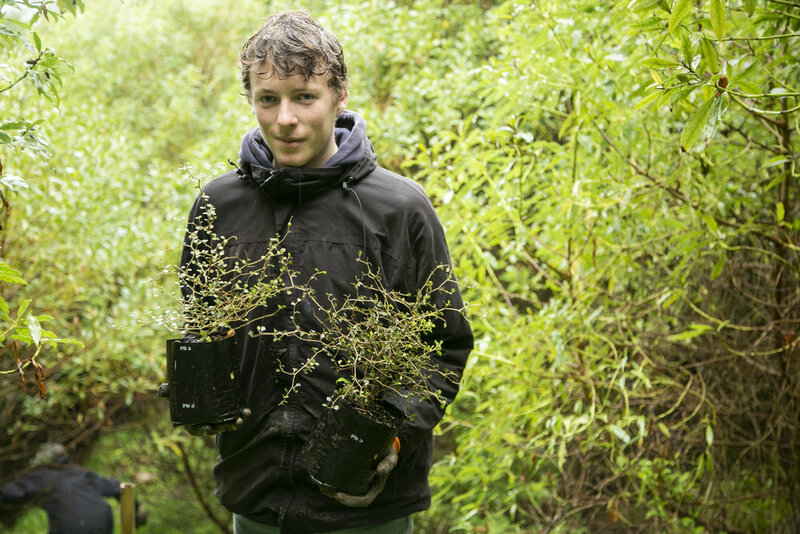 Wellington City Council land adjacent to the school is being restored to coastal native rainforest through planting and weed control efforts supported by school caretaker Dave McArthur and WCC, and with hands-on involvement of school pupils. Meets every second Sunday (from Feb - Nov) 10am - 12pm, in the grassy area adjacent to the lower Prince of Wales Park, accessed from the end of Papawai Tce or Salisbury Tce, Mt Cook. We do gardening, seasonal native planting, monitoring of the stream, and enjoy morning tea together.